As many of you already know, my primary love language is awakened when I receive books as a gift! So when time permits I do enjoy browsing through a new release section online to see what new books are waiting to be discovered and devoured! Anyways I decided to go to The Arsenal bookstore which is owned by my good friend, Brad Herman, to check out his new release section. Here is a list of books that I wouldn't mind getting my hands on! Don't read this book . . . live it. Close yourself away, capture time to feel the warmth of this story . . . as enduring as the universe, as comforting as our secret place . . . the loving embrace of a God who passionately loves you. Don Wood captures the textures, joys, and hurts real families are made of . . . and then shows us how to find out way into the extravagant love of a wonderful father, Almighty God. Don't just read this book, enjoy the journey for yourself . . . here is what life is all about. You've found a precious gem! 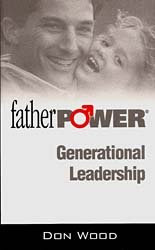 This book captures a desire within to excell as both a natural and a spiritual father to many. Also I am in the process of birthing THE CIRCUIT RIDERS along with a team of spiritual fathers to help fashion these emerging circuit riders. This just might be a book I need to send to these fathers. 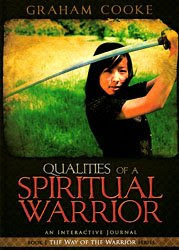 Qualities of a Spiritual Warrior is the most inviting book on the subject I've ever seen. It is refreshing to read a book on warfare where the author is not impressed with the devil. Graham instead restores us to our rightful place of being captivated with Jesus. His wonderful understanding of the ways of the Kingdom does more than just bring clarity, it empowers the believer to live with victory as the normal expression of following Christ. Anyone interested in breaking through barriers to cultural transformation will want to read this book. Like a modern-day Lewis and Clark, Pastor Johnny Enlow has done an enormous service to us all in surveying the ground before us. This book seems to have relevant information for the "cause & impact" paradigm that I've developed for personal and societal transformation. In a day when it is easy to be busy for God, Alemu Beeftu understands there is no easier place to lose Jesus than in the temple of religious activity and flurry. Far more than just a great book, Restoring the Altar is "an anchor within the veil" that calls us back to true covenant and passion for God. Restoring the Altar is a powerful manual that shows us how to keep the fires hot on the altar of our relationship with God. Restoring the Altar is written so that even a child could understand, though it is filled with the most profound principles of the Kingdom of God. Anything that stirs the fire within our hearts for the Lord Jesus Christ is definitely worthwhile our time and due diligence. What the Owenses write about here holds the keys to God's mightiest of workings: how He can, wants to, and will change entire nations . . . if we will accept our role. 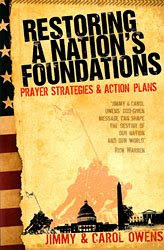 For some reason I'm intrigued by the use of "action plans" in the subtitle of a Christian book. I'd like to examine this "action plan" to see if it truly has merit. I've had a number of people prophesy to me that there is indeed a book within me. This also reminds me of the story of James Goll prophesying to Dutch Sheets back in the early 90s that there was a book in him that was to come forth...well, Intercessory Prayer was birthed and it has sold hundreds of thousands of copies in ten plus years. It s eems from the content page that power is also referred to as strength. I have a teaching that I do frequently called The Inner Fortitude of Christlikeness, which is a reference to the strength of God, i.e., the might of God, that resides within us by the Holy Spirit. I believe this is one of my primary calling to walk as a man of strength and power in the Lord. The name Brian literally means "strength and honor" as depicted by the Roman warriors in the famous Gladiator movie. There you go! A few choice books that I wouldn't mind hashing over as time permits! Please let me know if any of the aforementioned books struck you as you read the blog posting. Bless you!